HLD isn't just a good theory; it's useful (there are lots of things you can do with it) and usable (it's not hard to use it to do those useful things). This page summarises what it can do. Subsequent pages look in more detail. 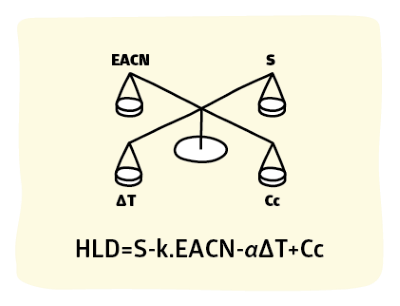 This section focuses on the use of HLD-NAC theory. EOR, Extended Oil Recovery, which funded a lot of the work on HLD because oil companies depend on this science to extract oil from older wells. $Millions depend on the theory being correct. Making nanoparticles. Take a w/o microemulsion of, say, barium chloride and mix it with a w/o microemulsion of, say, sodium sulfate, the two react to create nanoparticles of insoluble BaSO4. This is an excellent way to create highly stabilised (lots of surfactant shell!) very small (a few nm) nanoparticles with surprisingly little effort - provided you can used HLD-NAC to get into the right Type I or Type II space. 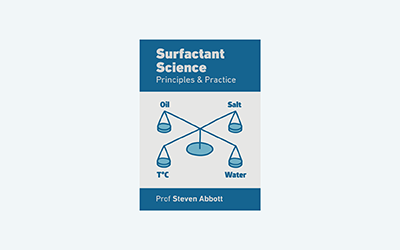 It is often thought that surfactants clean by lowering the surface tension. If this were true then one, cheap, surfactant would manage all cleaning jobs. In fact this general surface tension lowering is of relatively modest importance (and comes "free" with just about any surfactant). The key to removing an oil is ensuring that the oil-water interfacial tension is low - in other words that the HLD of that given oil in that particular environment (salinity, temperature...) is very close to zero. Whether it is crude oil mixed with water or palm oil from pressings, separating oil from water can be very hard. One excellent way to achieve this is by lowering the interfacial energy to zero - i.e. adding a surfactant to the system which brings the HLD=0. It seems counterintuitive to add a surfactant to separate oil from water, but that's how it's done. As explained earlier, the term Macroemulsion is used to describe "ordinary" emulsions and the "macro" bit is to distinguish them from microemulsions. Because "Nanoemulsions" are simply very small particle conventional emulsions, they are included within the definition of macroemulsions. The confusion is compounded by the fact that Microemulsions aren't micro at all but are truly nano. 50:50 oil:water emulsions - unstable-stable-unstable-stable-unstable. efficient use of energy because energetic mixing and heating/cooling are not required.